Surfeit bole to SIRF EAT! Itna khao jab tak phat na jao. Yaan phir, SAR se FEET tak, sirf EAT EAT EAT: immerse yourself in the sea of food. 1. Excess; an excessive amount: a surfeit of speechmaking. 2. Excess or overindulgence in eating or drinking. 3. An uncomfortably full or crapulous feeling due to excessive eating or drinking. 4. General disgust caused by excess or satiety. Well, we add another mnemonic for this word. 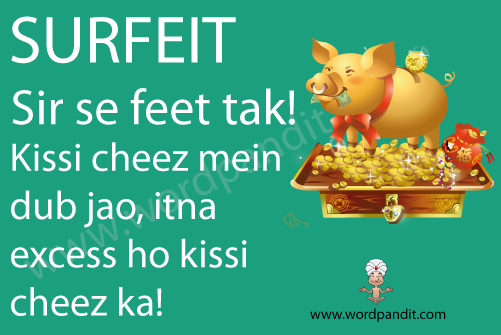 Surfeit =SIR SE FEET TAK. This mnemonic basically means to be immersed in something so much that you from top to bottom, there is only one thing that is visible: overindulgence to the extreme. Remember ‘surfeit’ is spelled with the combination ‘ei’ and not ‘ie’.